Dogs have always been a large part of my life and have become a passion of mine. As I grew older my understanding and love for the canine pet grew with me. I've always owned dogs. The family dog when I was a child, and then my own dogs when I was on my own. 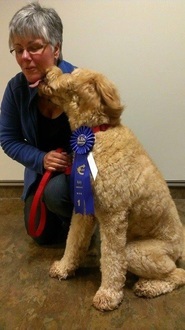 I was an Assistant Obedience trainer for 7 years. That knowledge has led me to become very involved with dogs. My own dog and I enjoy Obedience, Agility, and Rally O. It gives us one on one time while learning and having fun. I am a Certified Groomer. A member of the National Association of Professional Creative Groomers and must follow their Code of Ethics . I am also a member of the Ontario Dog Groomers Association. In addition, I remain up to date in the grooming industry and business world through webinars, video, and print subscription, as well as travelling to seminars. I look forward to working with you and your pet to get him/her accustomed to grooming in a calm, quiet "gentle hands grooming atmosphere", all the while making them look and feel their best. After all, everyone deserves pampering, even your best fur friend.